Are you going to study in Amsterdam on a year abroad? Send your luggage there the smart way with My Baggage! My Baggage transports luggage to and from university for over 30,000 students every single term. We provide a fast, reliable and affordable luggage delivery service to make your move to Amsterdam an easy one. We’re the No.1 student shipping company! Amsterdam is packed full of reasons to study there on a year abroad. The city is complete with good universities, a brilliant biking scheme, trendy districts, canals and superb architecture. With its tolerant attitude, cultural scene and cosmopolitan outlook, you can be sure that Amsterdam is a wonderful destination for aspiring international students. At My Baggage, we want to do everything we can to make your move to Amsterdam easy and stress-free by taking care of your luggage for you. You won’t have to worry about checking-in bags at the airport, there will be no waiting around at luggage carousels, and certainly no need to carry heavy bags around with you. Booking your luggage shipment to Amsterdam with My Baggage is easy. All you have to do to get started is simply register with your email address. To make a booking, you can get a quote by visiting our homepage. You’ll be asked to provide your luggage weight and dimensions, as well as your collection and delivery address details – so be sure to have this information ready. For the address in Amsterdam, we advise providing a local Dutch number – be that your own or someone you trust – just in case the courier needs to contact you about your shipment directly, as they will not be able to call UK numbers. Once you’ve booked, we’ll send you some labels to print and attach to your items. After that, we’ll take care of the rest. We’ll collect your items and deliver them straight to where they need to go in Amsterdam. With My Baggage, you’ll receive a convenient door to door student shipping service to save you from all of the hassle. Once you’ve booked, we will give you access to full online luggage tracking to allow you to keep an eye on the status of your shipment as it makes its way to its destination in Amsterdam. You’ll also receive text and email notifications to keep you up to date with your shipment. If you happen to have any questions or concerns along the way, we have a dedicated customer support team who can help via phone, email and live chat. Don’t hesitate to contact us with any queries you might have. Super fast shipping times to Amsterdam and to over 200+ countries worldwide. Up to date text and email alerts. My Baggage provides £100 free compensation cover on every single shipment. This value can be increased right up to £1,000 for a small additional fee during booking. Before booking your luggage shipment to Amsterdam, we recommend reading through our list of prohibited and no-compensation items to ensure your parcel is covered. At My Baggage, we make it our top priority to ensure that our prices fit well within a student budget. 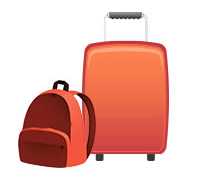 My Baggage is the welcomed affordable student shipping solution. We offer a generous 30kg weight allowance per item (almost double that of most airline baggage allowances) so you’ll have the freedom to bring everything you need without having to worry about paying extortionate airline baggage fees. We also have a very handy ‘Price Match‘ tool, so if you happen to find a cheaper price elsewhere, just let us know and we’ll do our best to beat it. See how much you could save on sending your luggage to Amsterdam with My Baggage by getting a quote today!